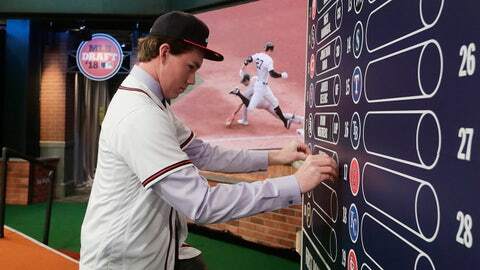 The Atlanta Braves and 2018 first-round pick Carter Stewart did not reach an agreement prior to Friday evening’s deadline, undercutting general manager Alex Anthopoulos’ first draft class in Atlanta as the talented 6-foot-6 right-hander heads to school. The two sides reportedly could not agree on a signing bonus — the No. 8 pick claimed a $4.98 million slot bonus — after a ligament issue in his right wrist was discovered during post-draft medicals. As long as the Braves offered at least 40 percent of slot value, they will be compensated with the No. 9 overall pick in the 2019 draft. Confirmed @jimcallisMLB’s report that the Braves did not reach an agreement with first round pick RHP Carter Stewart (8th overall, Miss. St. commit). A wrist ailment prevented the two parties from ever nearing an agreement. Losing Stewart means the Braves lost his slot value for their 2018 draft class, which prevented them from signing LSU arm Zack Hess, but it could allow Anthopoulos and his scouting department to aim higher in next year’s class with a much larger bonus pool. The extra first-round pick could also allow the Braves to be more aggressive in chasing players attached to qualifying offers in free agency this offseason. Stewart was a Mississippi State commit entering the MLB draft, though he could elect to go the junior college route. Scouting director Brian Bridges called Stewart’s curveball the best in the draft, but he became a realistic contender at No. 8 when his plus fastball jumped from topping out at 92 miles per hour to 98 as he matured physically. The 18-year-old struck out 128 batters in 61 2/3 innings with an 0.91 ERA en route to being named Florida Gatorade Player of the Year. Stewart allowed only 26 hits the entire season. Stewart was expected to join the best pitching stockpile in baseball when the Braves tabbed him with their top selection, continuing a long track record of drafting high-upside prep arms. This is the first time the Braves have failed to sign a first-round draft selection since 1995 top pick Chad Hutchinson elected to play college football.